In Slumber Party Massacre II we had an electrical guitar with a drill attached to it. Now, we can add a horn section to our murder band in The Town That Dreaded Sundown (1976), which features a trombone knife. Holy In-N-Out Burgers, we didn’t see that one coming. In a post-war post-Roosevelt South, a town that straddles the Texas / Arkansas border, Texarkana, is plagued by a lascivious lunatic lacerating lads and ladies on Lovers’ Lane. The masked killer is quickly dubbed “The Phantom,” cops order a media clampdown and the town becomes the centre of a national news firestorm. In true police procedural style, which we can trace like chalk outlines all the way to today in a show like Criminal Minds, one Captain Morales is brought in from The Big City to take over the investigation from townie rubes the likes of which would usually proclaim “dem Duke boys are in a lot of trouble!” in Hazzard county, a couple of states over. What we’re left with is a film that’s as undeniably creepy as it is campy, complete with portentous Dragnet voice-overs (“Western Union stopped evening deliveries!” “townsfolk stopped sitting by their windows!”), banjo music and police chases where the cops end up to their waists in muck. And, we’re treated to the helpful intonations from local prison psychiatrist Dr. Kress (whose awkward restaurant entrance is preceded by “oh, there he is now!”). Have no fear, Morales, played by Ben Johnson, not to be confused with the disgraced Canadian Olympic sprinter — an honest mistake — is on the case (“that murdering pervert could be passing us on the street ten times a day!”). The Phantom is the antecessor to the likes of Messrs.’ Voorhees, Myers, etc. But unlike some of his later 80s brethren, his kills are all unique and his MO different every time. We’ve got cords, bare hands, pick-axes, pistols with silencers, pipes and yes, a trombone knife. That’s why we got a brass band murder weapon when in actuality, the victim played the saxophone, which went missing for months following the killing. Still, the film is deeply atmospheric, rich and a minor classic from the era. 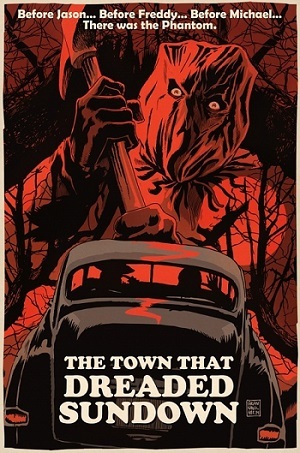 And like all minor classics, The Town That Dreaded Sundown was remade. This entry was posted in Horror and tagged 70s movies by Really Awful Movies. Bookmark the permalink.